Welcome to Dreaming Roses Eco-B&B, your home away from home in the beautiful hills of Ithaca, New York! 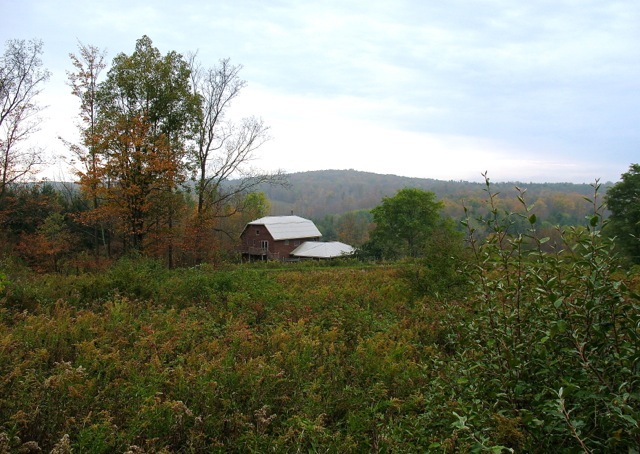 Dreaming Roses Eco-B&B is a small family owned and run bed and breakfast on 45 acres in the peaceful countryside just outside the vibrant town of Ithaca, in the heart of the Finger Lakes region of central New York state. A sunny room, a comfortable bed, a local farm-fresh breakfast, and vistas of gorgeous rolling hills all await you here at our solar-powered, eco-conscious homestead. Enjoy quiet walks and meditations in the woods and meadows of our land (inspiring in all four seasons! ), and use our place as a home base to explore the rich diversity of wonderful things to do in our area. Downtown Ithaca, with its outstanding arts and music scene and its many excellent restaurants and shops, Cornell University and Ithaca College, Cayuga Lake, numerous breathtaking gorges and waterfalls, Finger Lakes wineries and cideries, the renowned Ithaca Farmers Market, and so much more are all within a short drive. Please scroll to the bottom of this page for information on places to go and things to do in the Ithaca area. Choose from the Dream Suite - a two room suite with a queen bed and a double futon sofa bed, or the Sunset Room - a large room with a queen bed. Both options are sunny and comfortable, with bathrooms very nearby. Your breakfast will be made with mostly local and organic ingredients, including fresh eggs from our hens. Amenities include free wireless internet, laptop friendly workspaces, and bathroom essentials. You'll find trails right out the door, two ponds, and beauty all around you. We celebrate diversity and welcome guests of all backgrounds and identities. We look forward to hosting you! Please scroll down past the photo gallery below to read some reviews of Dreaming Roses Eco-B&B. Here's a small sampling of the reviews we've received on Airbnb. If you are an Airbnb user, you can read more of these on our Airbnb page here. Suzy and Todd are an AirBnB dream come true! They took such great care of us from start to finish. A lovely home and property that they so carefully maintain filled with lush green landscape, eco-friendly touches and a thoughtfully crafted space that would make anyone feel bliss. From the farm fresh breakfasts, cozy bedrooms, clean spaces, etc... you'll be hard pressed to find anywhere that comes anywhere close to what they offer! They made us feel so welcome in their beautiful home in such a way only family can do. Thank you Suzy, Todd and family. We love you guys! In for a quick college visit, we had a wonderful stay with Suzy and Todd. We felt very welcome in their lovely home. Suzy went out of her way to make restaurant reservations for us when she learned we were running late due to traffic. We were also spoiled with homemade and local breakfast items, and recommendations for local sights. Our rooms were lovely, very clean and comfortable. We highly recommend staying with Suzy & Todd. Our stay with Suzy and Todd could not have been nicer. Aside from having the best sleep I can remember, the exquisite grounds, and an amazing breakfast (with eggs that are naturally blue! ), Suzy went out of her way to accommodate my complicated diet restrictions due to allergies. Add to the above that Suzy's personal touch is everywhere; everything is made with the best of ingredients, from soap to local organic foods, some frest from their garden. The house is beautiful and the whole family is extremely warm, interesting, and creative (Todd's hand made guitars are truly magnificent!). Before leaving we had a lovely walk on a beautifly kept path through their grounds and the view from the top was just like the photo on their airbnb page, all in a burst of color. We loved everything about the visit and getting to know the Roses. We look forward to coming back! Suzy and Todd were wonderful, welcoming hosts. Their place was as described, set in a beautiful area with plenty of opportunities to walk in the woods. They were extremely flexible with our arrival time and communication was prompt and helpful. Delicious gluten-free, dairy-free corn bread, fresh farms eggs, milk, yogurt and coffee & tea. Would highly recommend. In a word - wonderful! The property was neat, peaceful and relaxing. Can't remember the last time I slept so well and so late. But what really made the experience was Suzy and Todd. They were gracious, accommodating and flexible hosts who provided great suggestions for our stay and a tasty, local breakfast. Our kids enjoyed the property as well. We're so glad we stayed here instead of a hotel in town. Suzy and Todd were fantastic hosts. They made us feel welcome and comfortable in their beautiful house in the countryside near Ithaca. Breakfast was homemade / local and absolutely delicious. As we were travelling with a baby and a toddler, they were extremely thoughtful to provide toys and books, and secure all power outlets in the rooms where we were staying. Their younger kid was very friendly and played with our daughter, who was also delighted to sit in the hammock in the garden and play with the dog. The house was very clean and nice. A really beautiful stay. This was the ideal Airbnb experience. The house is beautiful and the room is spacious, full of light and comfortable. The farm is a treasure and we only wish we could have explored it more. By far the best part of staying here was the hospitality of the hosts. Suzy and Todd made us feel like we were visiting old friends. Our weekend in Ithica was exactly what Airbnb is supposed to be! We've also received many wonderful comments in our guest book. The following are copied from there. Suzy and Todd were phenomenal hosts! What a beautiful home, land, and family. We are so grateful for their kindness and look forward to coming back soon! P.S. THANK YOU for making us feel like long-time friends! Thanks! Lovely place and lovely hospitality! We look forward to exploring the trails next time! What a beautiful family and home you've created and shared with us. Your hospitality knows no bounds. All the little touches and thought that's gone into making guests feel so special really goes a long way! The lovely breakfasts, comfortable rooms, local advice, trails, chickens... it was all perfect! We look forward to visiting again very soon!! (Extra note from Mollie) Thank you for a lovely stay. We do our best to eat locally and fresh when we are able, and you guys have inspired me to take that to the next level for our future family. Tezia, thanks for showing me all the chickens! Thanks for your excellent hospitality! Delicious breakfast and a great place to stay. Really made us feel welcome. We'll be sure to come back if we're in the area again. P.S. And thank you to your daughter for being so friendly and playing with Elena! Thank you so much! We enjoyed our stay here! What a wonderful hospitality & home! Thank you for prepare us for delicious bread! Looking forward to seeing you again! Thank you for opening up your wonderful home for us to enjoy! It was exactly as described and what we needed. Hope to stay again if we return to the area. Thank you so much for sharing your lovely home. We are so glad we took a swim in the pond! What a treat. We wish we could have enjoyed your hospitality for longer, but this made the last leg of our journey so much better! From the wondrous beauty of our waterfalls to the abundance of vibrant cultural activity, Ithaca and the surrounding region are rich with exciting places to go and things to do.